Rotherham United’s Assistance Manager Richie Barker says that today’s home win against Preston North End was a ‘vital three points’. He also admitted that the first forty-five minutes wasn’t the best the Millers have played and he’s not wrong, but when we thought we were going to be lucky and go in at nil-nil then getting that last minute goal was certainly a bonus. But for blocks on the line and some fine goalkeeping we certainly could have been three down before Will Vaulks’ fantastic free-kick. Preston were a hard working side, played off one another and were very quick on the break. In fact, I’d go as far as to say Daniel Johnson was the best player on the pitch today. But, aren’t they a moany lot! Not two minutes in and Johnson was in his second discussion of the afternoon with the referee and one or another of them was talking to him throughout the first half. Did they influence him at all? Well, that’s not for me to say but I hope there was a referees advisor in the stands making notes. In the end the Millers went two-up and then straight away it was two-one but we then did our ‘back to the walls’ bit and got all three points. Which isn’t a bad way to start the New Year off is it! 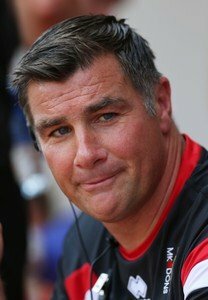 Richie Barker also said that there is illness in the camp which is spreading quickly as well as injuries all over the place. It could be very much a ‘if you’re fit you play’ side that faces Manchester City next Sunday.